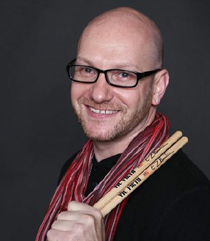 "Drummer Zeke Martin has made a musical mark for himself"
Born in Brussels in 1973, Zeke Martin entered the world with a pair of drumsticks in his hands. Influenced by his father, Stu Martin, who played with Jazz greats such as Herbie Hancock, John McLaughlin, Charles Mingus, Dave Holland and Quincy Jones to name a few, Zeke's musical repertoire includes a blend of Jazz, Funk, R&B, Reggae, Rock and more. Zeke Martin has performed in many locations throughout the world, including NAMM The Venue Stage in Anaheim, CA, The Berklee Performance Center, The House Of Blues in Boston, The Black Repertory Theater in RI, Minton's Playhouse and Sweet Rhythm in NYC, New Mexico, Chicago, Minnesota, Wisconsin, all along the East Coast and tours to Malaysia and Europe. Additionally, Zeke has shared the stage with such star performers as The Neville Brothers, The Funk Brothers, Ali-Ollie Woodson from the Temptations, three time grammy winner Justin Raines (Israel Houghton), Nicole Nelson (The Voice), Drop Kick Murphy's, Rie Tsuji (Beyonce), Jason Langley (Dream Girls, Memphis), Bronson Arroyo, and Regina Bell to name a few. Currently, Zeke resides in Boston, MA and he continues to perform with his band and teaches at numerous music stores (Music and Arts) as well as Northeastern University and Berklee College of Music.